Mozart's opera Il re Pastore dates from 1775 and was commissioned by his employer, the Archbishop of Salzburg as part of entertainments for Archduke Maximilian Franz who was visiting Salzburg. Classed as a serenata, the piece was not intended to be as elaborate as a full scale opera seria. 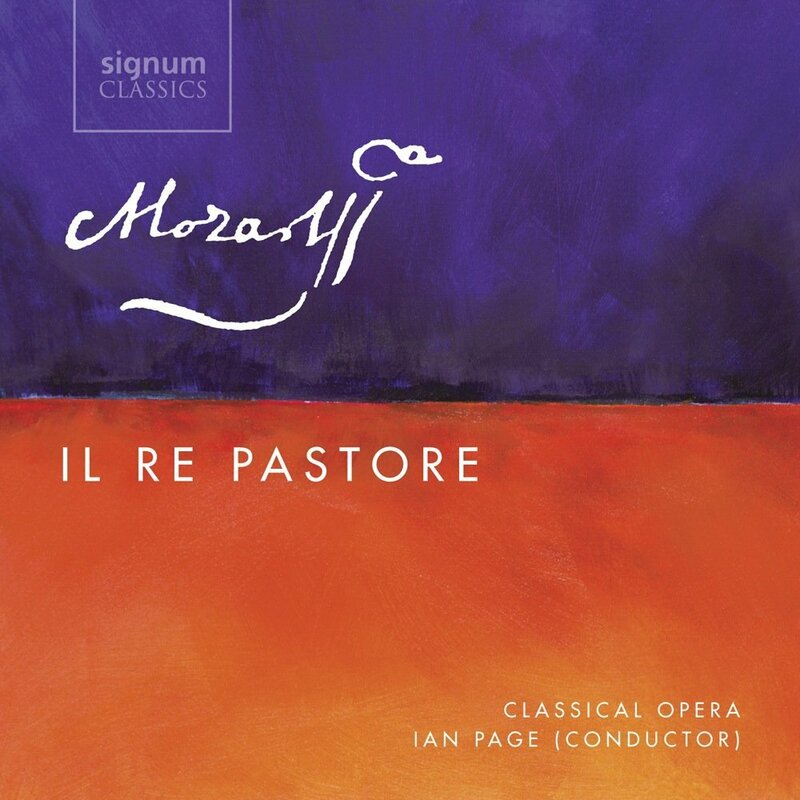 In their survey of the complete operas by Mozart, Ian Page and Classical Opera have reached Il Re Pastore. Their new recording on Signum Classics features Sarah Fox, John Mark Ainsley, Ailish Tynan, Benjamin Hulett, and Anna Devin with Ian Page conducting the orchestra of Classical Opera, with Steven Devine (harpsichord), Joseph Crouch (cello) and Cecelia Bruggemeyer (bass) providing continuo. Mozart's production of operas slowed down somewhat in the 1770's because in 1771 his employer died and was replaced by a new Archbishop of Salzburg who insisted that Mozart stay at home and fulfil his duties at the Archepiscopal court. Il re pastore, because it was commissioned for entertainment actually at Salzburg, is thus one of the few operas from this period when Mozart's music was developing as he reached his late teens. The opera sets a libretto by Metastasio originally written for Empress Maria Theresa's birthday and at whose first performance all five solo roles were sung by her children; as such it was very apt choice to entertain her youngest son when he visited Salzburg. As we might expect from Mozart at this period (he had already written symphonies no. 25 and 29 and Exsultate Jubilate) the music is confident in style and highly capable. But more than that, it shows Mozart really coming to grips with a sense of characterisation in the music and real atmosphere. Unlike some of his previous operas, this is clearly music by Mozart and it never resorts to the generic note-spinning. So it is somewhat a shame that the libretto is rather standard and somewhat trivial. Alessandro (Alexander the Great) gets involved in the love life of a young shepherd who is in fact the real heir to the throne of a city whose tyrannical usurper he has just overthrown. Being Metastasio there are unnecessary complications partly because no-one quite dare tell Alessandro that he is wrong! The first act essentially has everyone simply saying how happy they are, so there is little in the way of drama, but Mozart does produce a string of lovely arias. In the second act, things get complicated due to misunderstandings and Aminta gets one of the opera's best known arias, L'amero, saro costante; the longest aria in the piece and it receives a beautifully poised performance from Sarah Fox with Matthew Truscott's sweet-toned solo violin and Mozart weaving a web of wind textures around them. The music is not uncomplicated and it is difficult to imagine it being better performed than on this disc. Sarah Fox makes an appealing soprano hero, Aminta with Ailish Tynan as his beloved Elisa. Both get to express their joy in complex and elaborate arias. John Mark Ainsley is Alessandro, bringing a nice bravura swagger to the role (his first aria includes a fine pair of dramatic horns). Not quite fully mature Mozart perhaps and lacking the complexity of his later operas, the opera here receives a really appealing performance. Ian Page ensure that the pacing is lively and dynamic, whilst his cast seem to all be completely at home in Mozart's complex vocal writing. This was a piece designed to show off the talents of the performers and that is certainly what happens here. This opera has no complex textual issue but there is still an appendix as the performers give us a concert-aria version of Aminta's second aria. The booklet includes the usual extensive essay by Ian Page along with text and translations. 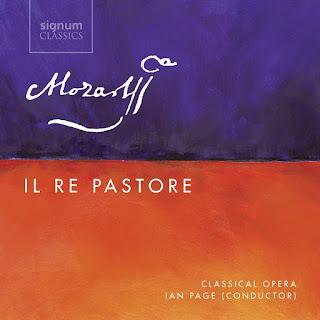 I can't help wishing, though, that Mozart had exposure to rather more a complex libretto and I have to confess that Il re pastore will never be in my list of top Mozart operas. But this brilliant new recording allows us to see how much Mozart was developing as an operatic composer.